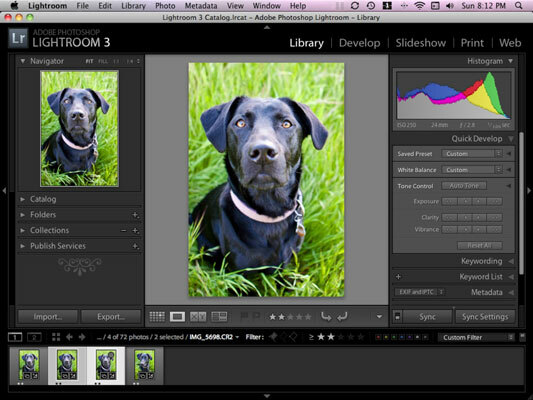 With Lightroom open, click the Library module in the upper right-hand corner of the screen. 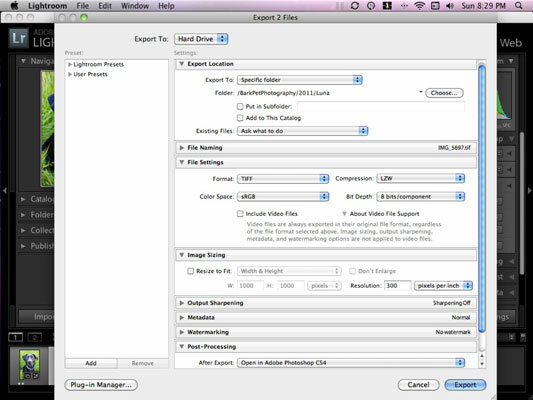 Choose the photos you want to export by selecting them in the horizontal filmstrip pane that runs across the bottom of your screen. To select a photo, simply click the thumbnail. To select multiple photos that are contiguous, click the first photo in the sequence, hold down the Shift key, and then click the last photo in the sequence. All photos between the first and last one are selected. To select photos that are noncontiguous, click the first photo and then hold down the Control key (Windows) or Command key (Mac) to select other photos. With your desired photos selected, click the Export button on the lower left-hand side of the screen. In the Export dialog box, choose a destination folder in the Export Location section. To choose a specific destination folder, first choose the Specific Folder option from the Export drop-down list and then click the Choose button within the Export Location section. You can now navigate to the folder you want your photos saved to. From the File Settings location, choose TIFF from the Format drop-down list. Keep the other options set at their defaults. In the Image Sizing section, type “300” into the Resolution box and choose Pixels per Inch from the drop-down list. In the Post-Processing section, choose Open in Adobe Photoshop from the After Export drop-down list if you want to make additional edits in Photoshop. If you simply want to save the file, choose Do Nothing from the After Export drop-down list. Click Export and you’re done!